Brian Smith is a two-time British road race champion and rode for Motorola in 1994. He now provides analysis on pro cycling for Eurosport and other channels. I spoke to him to find out his memories of riding the 1994 edition, and how he survived to finish the race. Brian Smith – British champion in 1994 for Motorola, picture taken by TAimages.com, used with permission. I asked Brian if a good showing in the spring season was integral to his selection for Motorola for the 1994 Giro. He had supported the then-world champion Lance Armstrong at Classics such as Amstel Gold and Liege-Bastogne-Liege, and took a win himself at the Grand Prix Herning in Denmark. There was a battle in the team, because Lance was world champion and he wanted things his way, and Hampsten was towards the end of his career, and was looking for people to help him. I think showing up with a win like that (in Denmark) I think that did gain me selection for the Giro, although I thought I merited it myself. It was always a constant battle to get into the right races, even before that, before Amstel, I did gain selection for Fleche Wallone and Liege but was unable to ride because I was sick. It was always a battle to get into the Grand Tours, even the Tour de France that year, because of the job I did for Andy Hampsten at the Giro, then becoming national champion for the second time, I found myself first reserve for the Tour de France. They asked me to ride the Tour de Suisse which was two weeks after the Giro but in the end I never got the chance to ride it. When you got the selection, was it a feeling of elation to ride your first Grand Tour, or was it something you were expecting, due to the form you had? Obviously I was happy to get the selection but it had been talked about at the start of the year, that that was a main race that Andy was going to ride, so I half-expected it but it was never confirmed to me. One of the main preparations for the Giro was the Tour of Romandie, and I never got selected for that team, so then it had me thinking. I took my opportunities, I went to the Grand Prix Herning in Denmark and I wasn’t having to ride for someone, because a lot of domestiques don’t get the opportunities, and I took it with both hands. It worked well for me. Into the Giro that year, I started at the bottom. As you know, the best staff look after the best riders, and the less experienced staff look after the newbies and the domestiques, so it took me probably a week into the Giro, and the next minute the top guy was massaging me, I was on his list. I asked him the question “why are you massaging me?” and he told me that the powers that be in the team, i.e I think, Andy Hampsten , had said “he has helped me a lot, I wouldn’t be in this postion without him, so we need to look after him”. The support role to Hampsten- was that carrying bottles and riding alongside, or was there anything more specific? Most of it was positioning and looking after Andy. Even in the last week of the Giro he put me and Michel Dernies (a Belgian domestique) in a position where we had to race for our life to get back on and think that if we hadn’t got back on, we wouldn’t have finished the Giro. 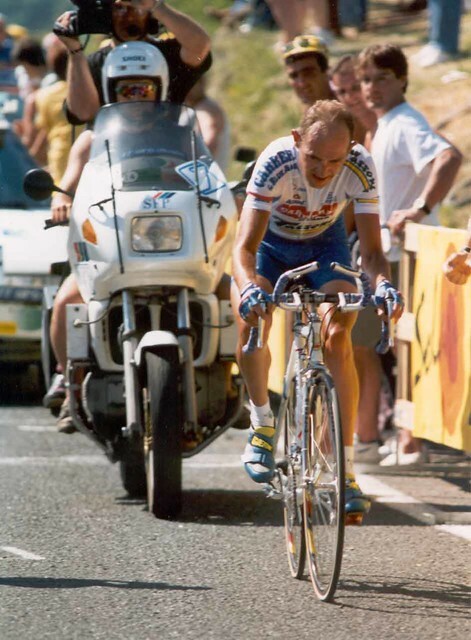 Andy was a person who needed to stop for a natural break, and I remember one day – the race started at the Lauteret climb and went towards Briancon [stage 21]. We were coming down Les Deux Alpes (in the neutral section) and he stopped at the bottom, and we had to stand there and wait, and fortunately Michel stayed with us, normally it was just me. We got him going, and started towards the bunch and a lot of the directors were shouting at us that the race had already started, so myself and Michel Dernies got him to within 100m of the back of the group and he jumped us and got across the last bit, and me and Michel were in no-man’s-land, dropped on the Lauteret. We managed to catch a couple of riders, Giovanni Lombardi and Davide Bramati from Lampre at the time (Bromati is a DS with Omega Pharma – Quick Step), and one other rider, and we chased the whole way. We were in the cars for the next 30 or 40km and I managed to climb the Mont Genevre and got back on with Michel. Then it started snowing, and Alvaro Mejia was another climber on the team, and Alvaro was struggling. Andy said he was fine so he went on, and myself and Michel stayed to try to nurse Alvaro to the finish. He was a Colombian rider, who had finished 4th in the Tour de France the year before, so we had to help him. We went up Sestriere, down the other side and then back up Sestriere and finished in 2cm of snow at the finish. For me that was one of the hardest stages, having spent the pretty much the whole stage helping someone or chasing to get back on. When I look back on it, if I hadn’t had chased and got back on [I wouldn’t have finished], I know many riders had climbed off that year, I think there was about 99 finishers. 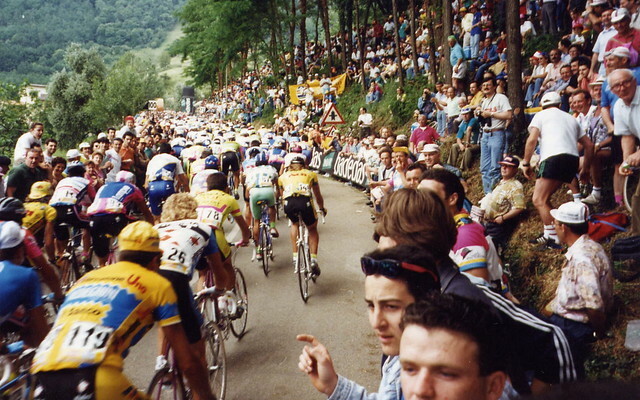 In 1994 there were no rest days- it was 22 stages in 21 days. The rest days for me were the time trials. I can remember the time trial up the Passo Del Bocco [Stage 18], I was in 39×23 for most of it and I think for anyone to ride that gear up a climb, that’s not a rest day. For me there were specific stages, where I thought “if I can get myself over this climb, you’ll make it to the finish”, but the major day for me looking back on it was in the last week of the race , twice up Sestriere in the snow, having to stop with Andy, getting dropped earlier on, having to chase and having to look after Alvaro. That was the day I realised I was lucky, and I got round the Giro. You mentioned that a lot of guys climbed off, and we know now, looking back on it, that around that time the pace of the peloton was beginning to be enhanced so it’s a good achievement to have stuck it out. I think what a lot of people don’t realise is that at that time, the Motorola team were a clean team – bread and water, and I don’t have any problems saying this. When I looked at the teams and the riders [ie of the other teams competing],I thought, I will be OK here. Even on the first stage there was a big crash because of the speed they were going round the corners at. I remember going round the corners on the first stage and my wheels were actually skipping round, we were going so fast. It was when the Gewiss team, we used to call the Gee-Whizz team, were on the front, with Bjarne Riis and Berzin and all these guys, that was when a lot of big questions were being asked. 1994 was the year that Pantani won two stages in the last week, Indurain went there to try to do the triple- the Giro, the Tour and the World Championship, and even he was blown away by Berzin and Pantani that year. The racing was just, phew, there were probably 40 or 50 guys who were head and shoulders above everyone else. The grupetto that year was probably 60-strong and that was a big grupetto. We were the real race, and the other riders in front were just killing it. The thing is, I don’t think that there has been a Giro that I have known that hasn’t had a rest day. There were guys outclimbing me – OK, I had a job to do which was to get Andy to the front, ride the first 2 or 3km of a climb and then pull off to the side and let him go on – but there were people in that group who weren’t climbers, they were sprinters with big legs. It was a wee bit demoralising for me, the Giro in 94, because I thought I would be OK and everything would be fine. But it’s only looking back on it now that you see the performance enhancing drugs that were evident in the early 90s, although it is speculation. I look at it now and I think I wish it was 94 again, so I could get a ride and perform. Someone taped the television coverage and sent it to my Dad, and he saw a few glimpses of me, as well as finishing in Milan, and he took that to his grave, that his boy rode the race. My mother and father were cyclists, who used to tour every year in Italy for a month, so for me to ride the Giro was a great privilege and an honour for them. Despite the regrets it was a good achievement, there are positives there. But Hampsten was 10th and was he let go by Motorola and you too? Andy was a former Giro winner and he finished 10th, and he turned round to me and said ‘I can’t compete now with these guys’. It was a new era of cycling, as we look back on it now with the Lance Armstrong thing and other things that have come out. It was definitely the start of a new era. Looking back on it I am proud to have finished the Giro and proud to have helped Andy, but at the end of the day, sponsors are sponsors and 10th wasn’t good enough, so Andy had to look for another team, and unfortunately he wasn’t a big enough name to take me with him and I had to fend for myself. The Giro is a special race and I have still got a lot of passion for it. I’d love to have ridden the Tour but for me, the history, the passion – the Giro will always hold something in my heart. Brian Smith finished 95th @ 3hr 22min 35sec with 99 of the 153 riders finishing the race. This entry was posted in Pro cycling and tagged Brian Smith, Italy on May 24, 2013 by Owen.